Part 1 of the debate features opening statements and rebuttals. Part 2 of the debate features cross examination, Q & A from the audience, and closing statements. It is a privilege to be with you here tonight. Abu and I have been planning and preparing for this debate for months and I am grateful for the chance to stand before you regarding this very special topic. Let me thank the leaders of the Dutch Reformed Church for allowing us to meet in this beautiful hall and the IPCI for their part in the debate as well. My opponent tonight is a friend. We have eaten together on a number of occasions and each time our conversation turns to the differences between our religious convictions. Abu is a man of intelligence and there is no debate about that tonight. It is my goal during this event to exhibit an attitude of mutual respect but not an attitude of compromise. What is under debate tonight is the radically different ways by which we view Jesus. We are not debating the rights of women, posture in prayers, food laws, or even Jesus’ claims about himself within the Qur’an. For sake of time and clarity, Abu and I have narrowed this debate to what Jesus claimed about himself within the pages of the New Testament Gospels. 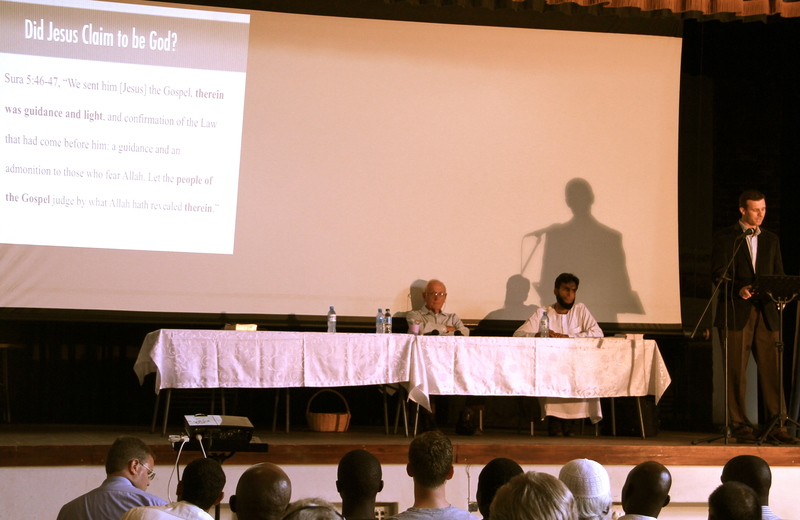 Some of you may have been to Abu’s lectures a couple years ago on the topic “Jesus Christ in Islam”. In those lectures, Abu was not afraid to interact with the Bible. He held the Scriptures in his hands and quotes often from its pages. 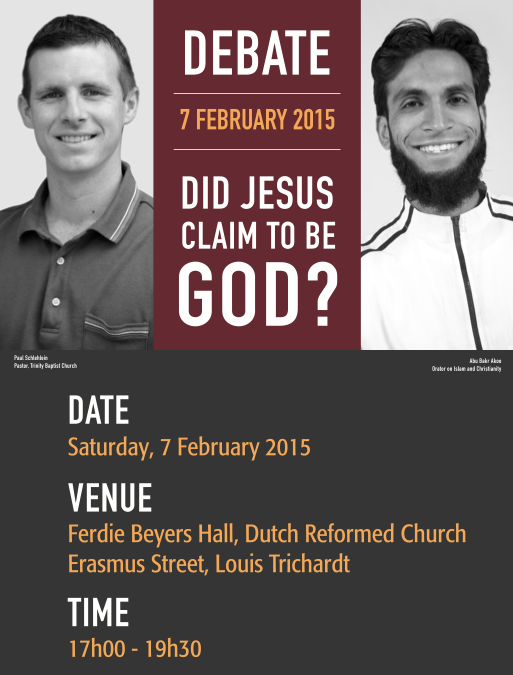 On that night, he was not merely arguing that Jesus denied deity in the Qur’an. That much is obvious. Rather, he argued that within the Christian Scriptures themselves Jesus never claimed to be God. This is the challenge for the Christian tonight. The two predominant philosophies of argumentation within Christian apologetics are evidentialism and presuppositionalism. William Lane Craig, JP Moreland, and RC Sproul are evidentialists. Greg Bahnsen and James White are presuppositionalists. Evidentialism holds that religious beliefs are only rational if they are based on evidence. They employ much history, philosophy, and science in their argumentation and seek to find common ground with their opponent before working toward their position. Presuppositionalism is often associated with Cornelius Van Til (and his students Greg Bahnsen and John Frame) because he so persuasively argued that most human beliefs depend on unprovable basic assumptions and are shaped by faith or the lack of it. Presuppositionalists are not interested in finding common ground, acknowledge their presupposition that the Bible is true and therefore use it forcefully and freely. When charged with circular reasoning, the presuppositionalist shows that his opponent also has presuppositions regarding his source for truth, be it reason, the Qur’an or whatever. Here is an example of how to spot an evidentialist. In a debate between William Lane Craig and Shabir Ally on the resurrection of Christ, Ally argues that the spear thrust to the side of Jesus was only a prick and quotes Raymond Brown. Muslims love quoting Catholic scholars who undermine Scripture, which is just the same as saying Catholic scholars. Assuring the death of crucified victims by a spear thrust into the heart to make sure he is dead is attested in classical sources. For example, Quintilian attests this. So this is not just in the Gospels. It wasn’t until the Q & A time that a non-PhD from the audience even brought up John 19:34.